When times get tough, there is nothing like having a friend who can relate to your struggle and help you get through it. For the man in this video, that friend was Chance the dog. Chance came into his guardian’s life after a series of tragedies. The poor pup was hit by a car and left by the side of the road to die. The accident left the poor dog paralyzed so the shelter that found him slotted him for the euthanasia list. Thankfully, before this could happen, San Antonio Pets Alive stepped in and rescued Chance. 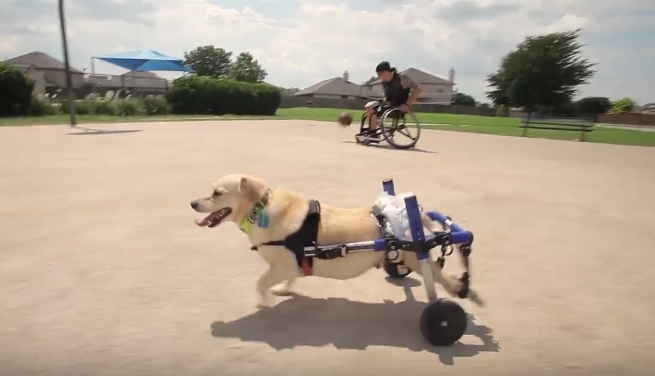 In this new home, Chance was set up with a wheelchair and his entire life started to change. When Chance and his now guardian met, it was love at first sight. A fellow wheelchair user, Chance’s dad recognized the pup’s amazing spirit and had no hesitations about making Chance a permanent member of the family. Together, there is nothing that these two can’t proving that with the right attitude, a little compassion, and a good friend, nothing is impossible. Responses to "Disabled Dog Finds Perfect Forever Home With a Man Who Also Uses a Wheelchair "